If you know anything about Magpies Gifts, you know we love our monograms. And while that may have something to do with our Southern roots, it has a whole lot more to do with the added touch that personalization brings to the present process. Monogrammed gifts convey an unspoken message. They show you took a little added time when picking out that just-right find, and made an effort to make the present uniquely theirs. Those details don’t go unnoticed. The best part? The possibilities are endless. From toiletry bags, to laptops, to baby blankets and even phone cases, if you can dream it you can probably customize it. Here are a few handy tips on getting things started. Remember, monogramming is a process. We suggest placing your order a week or so before you need to have the gift in hand, just to be safe. Talk with the shop for a rough estimate, since certain times of year are busier than others. If you must have the gift ASAP, ask about rush orders. For a small fee, your monogram can probably move to the front of the line. Spa robe or pajama set? Beach bag or towel? YETI cup or S’well bottle? When it comes to gifts like these, baby, you’ve got options. Keep the gift recipient in mind. Think through their favorite colors, or which items they might be more likely to use. These factors can help guide you along the way and ensure a purchase you’re proud of. 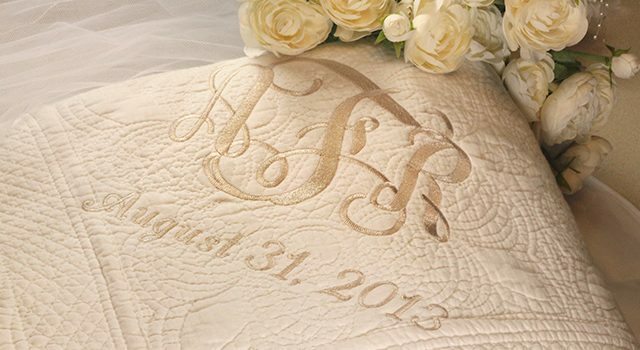 Certain limitations exist in the monogramming world, so be sure to talk your vision over with the pros. Will your desired design lead to a sewn-shut pocket? Does it sit in a space the monogram machine can’t reach? Could the color combo make it hard to read? The person behind the counter will be able to talk you through the process. Wanna know more? We’re always happy to help! Visit our monogram page for a little inspiration, or stop by and see us!